Belvedere has to be a highlight of any trip to Vienna. Baroque palaces? Yep. Priceless art? Yep. Photogenic views? Yep. Oh, and is that one of the world’s most famous paintings on the wall? It certainly is. When you successfully tweak the noses of the Emperor’s enemies, you can expect a little bit more than a thank you note and a bottle of wine. Which is why Prince Eugene of Savoy – military commander and all-round national hero – managed to accumulate enough lands, positions and wealth to construct some of Vienna’s most impressive buildings. Including the Baroque palaces (one at each end of the gardens) at Belvedere completed in the early 1700s. 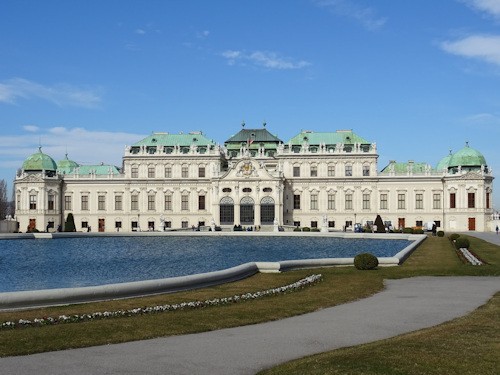 The two Belvedere palaces are open all year and easy to reach, but don’t share the same opening times. Upper Belvedere (i.e. Klimt) opens at 9 am, while Lower Belvedere opens at 10 am. Both close at 6 pm (9 pm on Fridays). The main gardens are free, but (at the time of writing), it’s €16 for a standard adult ticket to Upper Belvedere and €14 for Lower Belvedere. U19s go free and there are other concessions. I’d strongly recommend a combination ticket – €22 for both palaces. I’d also recommend getting tickets in advance, as the ticket office queues can grow quickly. For example, there are skip-the-line tickets here*. 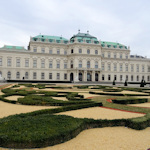 Alternatively, the Vienna Pass (review) covers the Belvedere sites. If you’re planning to return to Belvedere during your stay, consider an annual ticket. Think of the buildings and exhibitions as one and the same. Your entrance ticket covers entering the relevant building(s) and viewing whatever’s inside. If an exhibition does not interest you, you may still want to go through it because that’s how you also see the inside of, for example, the palaces. In many parts of the main complex, look for a board in German and English describing the decor and perhaps history of the room or area you’re standing in, together with a relevant picture from the early 18th century. We’re very lucky – a chap called Saloman Kleiner produced a series of copper engravings of the interior and exterior of Belvedere in the 1730s, so we have a pictorial record of what the original palaces and gardens looked like. You can buy a copy in the Belvedere shops. The main art collection is in Upper Belvedere. So if you’re pushed for time, this is the one to visit. It’s also where you’ll find the Klimt paintings, including the Kiss. But if you do have time, I recommend popping into Lower Belvedere, too. Everything is within a relatively short walk of each other. Be warned that with the turnover of exhibitions, one or two areas may be closed temporarily for set up. This does not normally affect the permanent collections at Upper Belvedere, of course. Ah, there’s a whole page of advice for that.